Iceland Winter Travel- Learn the Road System! If you are planning an Iceland winter holiday it is best to be over-prepared for lots of snow and wind. In one moment you could be enjoying a beautiful sunny day and within minutes the weather can change to a blizzard where you can’t see a thing in front of you! We discovered that Iceland in winters can be very unpredictable which can lead to travel issues throughout the country, as was the case our February Iceland holiday. In case you are thinking of having a holiday in Iceland; check out our experience and a “must” pack list for your outings. Our trip started off with us arriving on an early Sunday morning. We could see from the windows at the airport that we landed we were going to definitely get our winter in Iceland holiday. As we went to pick up our car at the rental counter we were given some advice- a storm was coming and he didn’t think we would make it to our hotel destination an hour and half away. For fear that we would end up homeless for the night, I immediately called our hotel the Ion Adventure Hotel who in turn called the City Ion Hotel in Reykjavik. They kindly gave us the last room (which was a suite) available for the night. So out we headed from the airport. The roads were getting seriously difficult quickly, we decided it was best to go directly to the hotel. Luck continued to be with with us as we grabbed the last parking spot which happened to be right in front of the hotel. Upon entering the Ion city Hotel we found a few couples in the lobby hoping to book a room for the night. There were no rooms left, not only at our hotel but also the entire city was sold out. we were informed the airport was shut down soon after we drove off. So now the city was over booked with guests who could not fly out and who could not get to their hotels, homes or vacation homes outside of the city of Reykjavik. The hotel staff went above and beyond trying to help the people who were looking for somewhere to stay, calling other hotels and homes to hopefully accommodate some of the stranded people. We realized very quickly how fortunate we were having a bed to sleep in for the night. We knew coming to Iceland in February could be a cold and snowy holiday, and thats exactly what we got. Up early the next morning we headed out of town once we confirmed the roads were reopened. We had a tour to catch approximately one and half hours away. Feeling confident we entered the address into our GPS on our phone and easily followed the directions. As we approached the last turn to our destination something didn’t look right, as in nothing was there. Time to call the tour office. To clarify, we managed to follow the directions all the way to the “other” town with the same name. One of the towns is in the Southern part of Iceland, which we navigated to, while the other was more north, 2 hours away. One thing you learn, while traveling to Iceland in February, the Iceland travel tour companies are used to mishaps and weather issues and are very accommodating. 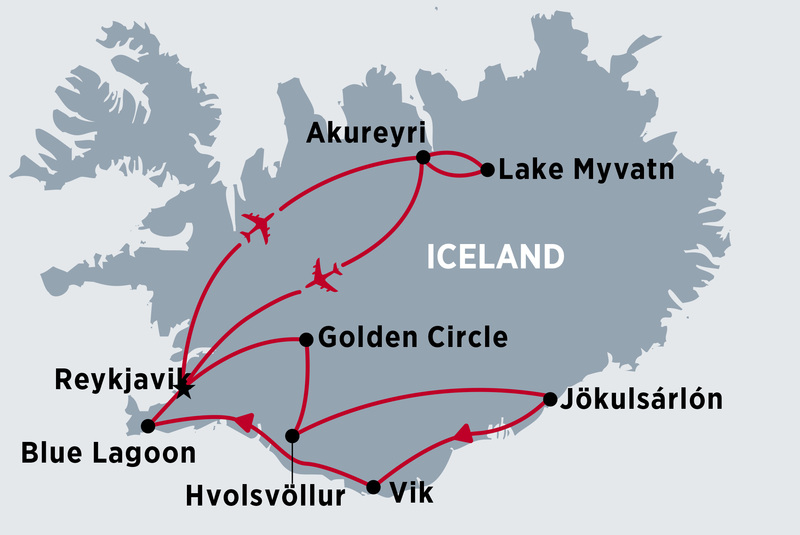 They rebooked us for an Iceland Glacier hike for Wednesday. From here we thought it was best to continue to take in the beautiful sites as we drove towards our hotel. In hindsight, it was a good thing we didn’t make the tour, because storms came in again and we would of been stuck a couple of hours away by the time the tour would of ended. Which would of resulted in us be stranded somewhere. Above all, it is very, very important to know, you have to keep in contact with the Iceland road (road.is) web site . You could check it one moment and roads will be open and 15 minutes later they could shut down. They do not put up barriers, there is no real time to do that. With the snow coming down combined with the wind up to 50 miles an hour blowing more snow off mountains onto roads, the roads can become a major snow bank quickly in Iceland weather February! The next day we left our hotel and drove about 10 minutes. Running into a “white out” where we literally had to stop our car and sit for more than a minute till we could see again, we decided to come right back to the hotel. Again, our intuition was good on this Iceland winter trip. Other cars that left the hotel in the morning all returned about 5 hrs later following a snow plow. Talking with a few of the guests that were in those cars, we found out some were stuck in snow banks for 4 hours waiting for help. Understanably, they were noticeably shaken and frightened from the experience. Thanks but no thanks I will skip that particular Iceland winter experience! Our trip was still fabulous, we were able to see some gorgeous nature creations as will be in other posts. Simply said we loved Iceland! But we learned it is best to be over- prepared for the Iceland winter holidays. Putting together and Iceland packing list is highly suggested, It is essential you have the right Iceland gear. The indoor clothes to take to Iceland would be what you would bring to any winter vacation; cozy sweaters and warm comfortable pants. Inside is warm and cozy so no worries there. It is for the outside you need to know what to wear in Iceland in February! We found our packing list of clothing for Iceland in February helped us out tremendously! Here are a few things that we packed that at the time we thought we might be “over doing it”, but thankful we did! Click on any of the items pictured to take a closer look. Canadian Goose coats for temperatures below Zero degrees. More for the winds, the temperature was mostly in the 20’s and wonderful on the sunny days, I even had my jacket open at times. But boy was I happy with my Canadian Goose coat when it was colder out. The coats are well known for a good reason- they work! 32 degree long underwear. Why did I not know about these before?! (okay I live in Florida- so maybe that is why). Amazing! Thin, silky feeling but keep you so nice and warm without sweating. I will never go anywhere cold ever again without these. We brought three pairs each for a weeks stay. Smart Wool socks : Three pairs each for the week, you can wear them more than once. Feet were never cold! Waterproof Pants: These are to put over any pair of pants you have on. Waterproof pants for Iceland winter is a must. Waterproof and insulated gloves: If you can get the ones that allow you to still work your cell phone that is even more of a plus. Sound Touch all weather gloves are something we found online which turned out to be a fantastic purchase! BONUS- you can use them on your touch screen! Best gloves for Iceland winter! Hat with mask: Not really very fashion forward, but even I was appreciating them when we went whale watching. I loved the easy of the Magnemask that we purchased. You were able to easily pull it up to hold secure by magnets! Waterproof Boots: Probably one of the most important items to have for dressing for winter in Iceland. Invest in a good pair, where them around the house before leaving on your trip to make sure you have no issues with fit. I loved the Sorel for myself as well as my husband. Ice/snow Grippers with water proof boots: Strangely enough, I could not believe the amount of people I saw trying to master the ice with sneakers on. Not only was it ridiculous, but it really was dangerous. By the time they walked through the snow and ice they had to be soaked! Grippers make every step you take feel more secure on the ice. Easy to put on and take off- why wouldn’t you? Every store in Iceland was selling them, maybe thats a sign? Blanket: An extra blanket in the car can come in handy if your cold or your seat has gotten wet. Zip lock bags: In fact, a ziplock bag is a great way to protect your phone from getting wet if you are using it for photo’s or just to given extra protection in your pocket. Ice Scrapper: Before you drive off the rental car lot, check that you have a snow brush in the car, you might need it! Camera, Video Camera, Drone: You will want to capture everything in this beautiful country! I bought Kevin a Breeze for Christmas, works great but the days we went to use it it was little too windy. Yes, they would be lying about their nose, lol! I’m glad it was my husband driving and not me! You know what? I do plan on going to Iceland in the winter so this list is perfect! Not sure if I’m brave enough to drive though. Driving in the snow and ice is something I have no experience in. And I’d like to second your recommendation about Sorel boots….. they are a life saver! If you don’t have experience driving with snow and ice I wouldn’t practice in Iceland. You might end up with perfect roads, but there is always a chance that a storm could come through. Sorel 🙂 the best! It is beautiful in winter! And you are very welcome! I love it! And it was not so bad for me being from Rochester New York originally (I still go even in the winter) But some people were not prepared at all! That is so true! Love that quote! Wow! What a fun (and intense!) winter adventure! Great tips on surviving and Iceland winter and it seems like a beautiful country to visit! I’m yet to experience winter, but I do know the feeling of forgetting to pack important items for a trip. This is such a great list, Sherrie. Personally, it’ll be a great reference for me when I do get to visit Iceland (or any other winter destination for that matter)..
Good to know that you were able to get a room just after arriving in Iceland. I also like the idea of how the hotel you were staying in went out of their way to help the other people who were looking for a room. Reading how GPS directed you to another town with the same name, it reminded me of a story of a guy who used GPS to his destination but it took him somewhere else after hours of driving and if I’m not mistaken stranded in his car during blizzard or something like that. I think it was in Iceland and he was famous across social media for several months because of that. But I’m glad you didn’t have to drive for hours like him. These are some excellent tips Sherrie. I didn’t visit during winter, just before, and it was still freezing. The website is a great resource for anyone wanting to drive there. It’s a great country. I would love to visit Iceland. But, Im not quite sure I could handle the weather, winter or not. Anything under 25°C is cold for me. Lol. Nontheless, you’ve included some great tips on how to prep for a winter vacay here. It’s also good to know that the tour companies are so accomodating. It’s not often that this happens. How crazy that the road conditions can change so dramatically and quickly. Good thing they have a way for people to keep up with it! I can’t believe you had to sit and wait in the car because it was not possible to drive due to the snow pouring!!! I appreciate these tips and thanks for sharing your experience so others will not be caught off guard. Great preparation advice!